In a Dutch oven, cook bacon over medium low heat, stirring regularly, until bacon is crispy, about 8 minutes. 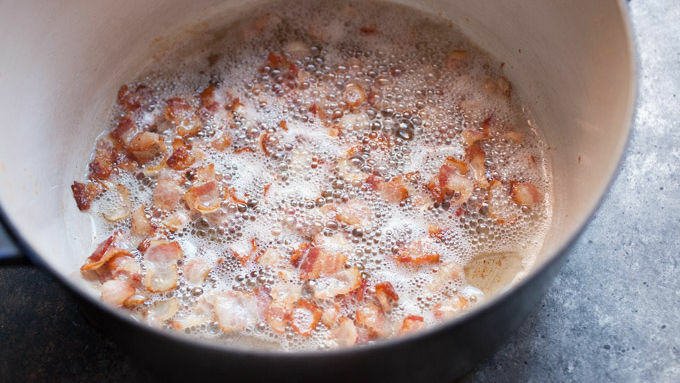 Remove bacon from pan and drain off grease, leaving 2 tablespoons in pan. Add onions and garlic to pan and cook for 2-3 minutes until soft. 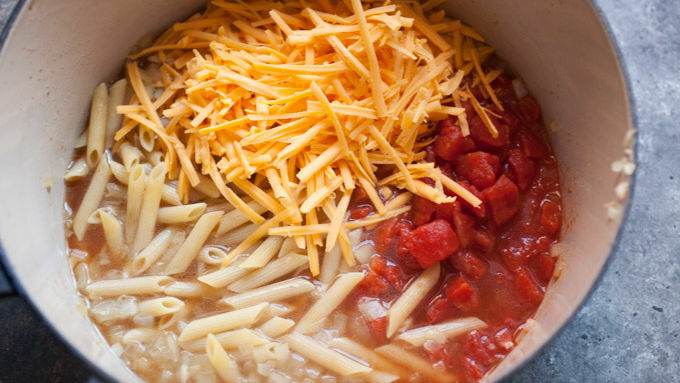 Add pasta, diced tomatoes, water and 2 cups of cheese. Stir together and bring to a simmer over high heat. Once simmering, reduce heat to low. Cover and cook for 6 minutes. Remove cover and stir. If the pot seems very dry, add 1 more cup of water. Cover pasta and cook for another 4 minutes. Test pasta to make sure it’s done, and season with salt and pepper. (It’s okay if there is still some liquid in the pot at this point.) 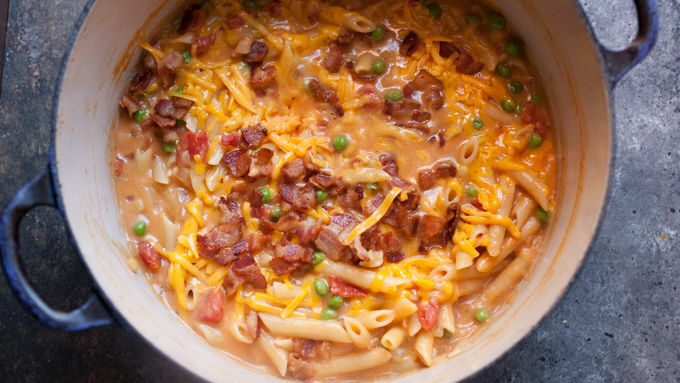 Add peas, cooked bacon and remaining 1 cup of cheese to the pot. Remove from heat, cover and let sit 3-4 minutes. Garnish with fresh scallions and serve immediately. Feel free to substitute other cheeses, but stick to cheeses that melt well—Monterey Jack, gouda or gruyere would be nice. 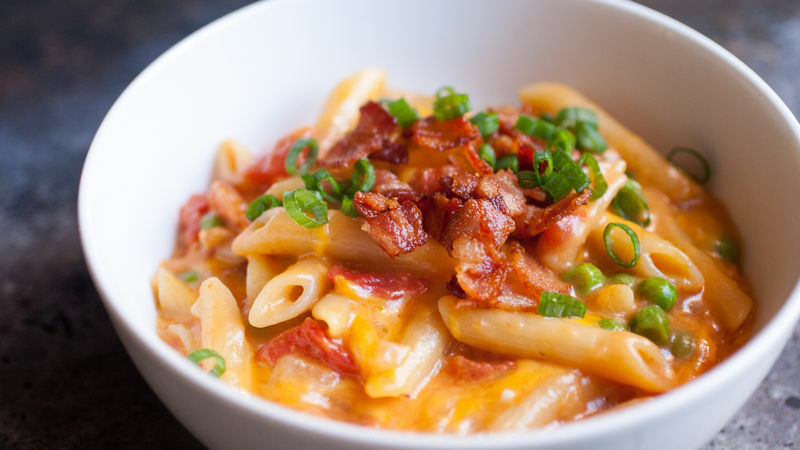 Comfort food checklist: Bacon? Check. Cheese? Check. Pasta? Check. That pretty much sums up this delicious pot of penne. Before spring comes, stay warm with this big pot of warming pasta. The good news? You can make it all in one pot so there’s really very little after dinner clean up! The ingredient list in this pasta is surprisingly short, but each ingredient brings big flavor—starting with the bacon. The key is to cook the bacon first and crisp it up in the pan, but then remove it so it doesn’t get soggy while the pasta cooks. You’ll also use a bit of the bacon grease to cook your other ingredients. There’s one ingredient that may look like an afterthought, but is actually so important, and that’s the frozen sweet peas. They add these little pockets of sweetness and pops of bright color to the pasta, and really liven it up. Don’t skip them! 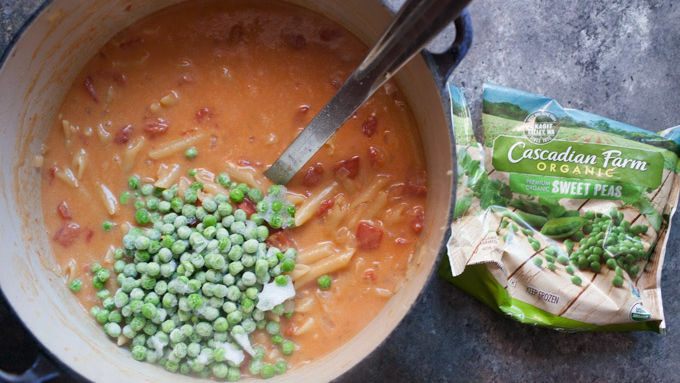 One you have everything in your pot (except the peas—those go in at the end) bring everything to a simmer. 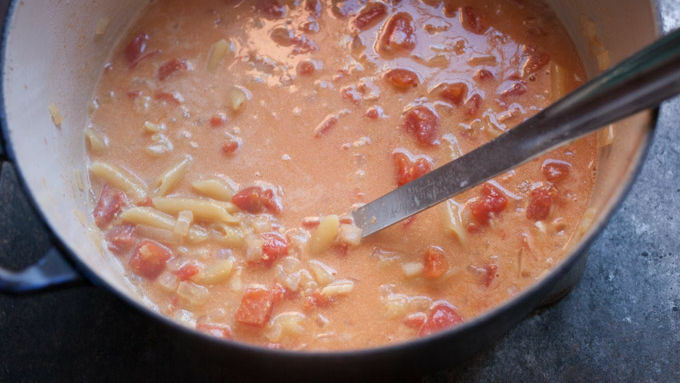 The three cups of water plus the water in the tomatoes should be enough liquid to cook the penne, but you’ll want to check on it about halfway through to make sure it isn’t sticking and you have enough liquid to finish cooking. Believe me, you’ll make friends (or further secure the admiration of your family) if you make this quick recipe for dinner!